Announce your menu or entertain guests with these chalkboard placemats. 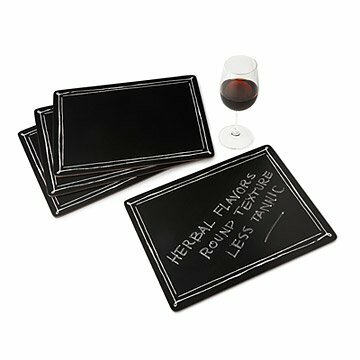 Whether it's a six-course tasting menu or weeknight dinner a deux, make your meal a truly unique experience with these chalkboard placemats. Backed with non-slip cork, these creative table settings can be used to announce your pre-fixe preparations, wine pairings, party theme, or guests in the form of oversized place cards. You can also set your company up with their own pieces of chalk (not included) to encourage dinner time doodling or to play a game after dessert has been served. Set of 4. Made in China. Placemats (obviously),gameboards, signs, canapÃ© or cheese labels. Use your imagination! These are such a great idea! I bought as gift for friend but liked so much I bought more for myself! Chalk it up to fun! Great for leaving fun comments and for grandchildren.